Here at Hog Roast Wantage, we sometimes have customers who are keen to use our catering services but are concerned about their budget – namely, that it is not enough to pay for a hog or spit roast feast. You’d be surprised at how affordable it can be and we don’t skimp on quality or freshness, either! We have packages for every budget, regardless of the type of event or party that you’re planning, so whether it’s a wedding reception, birthday party, corporate hospitality or anything else in-between, we can impress your guests with gorgeous food and at a great price. Grant, one of our new customers, recently called Hog Roast Wantage regarding a corporate function that he was organising for his local business. With a strict budget, 50 guests to feed and a handful of them needing alternative dishes due to dietary requirements, Grant was concerned that we wouldn’t be able to meet his needs, but gave us a try anyway, just in case. He was very surprised but more than happy to hear that we could, including serving lots of delicious hog roast rolls and supplying three vegetarian options, one vegan choice, and one gluten-free dish. When it comes to ensuring that everyone is fed well at your social occasion, we go the extra mile by providing plenty of options to suit different tastes and diets. 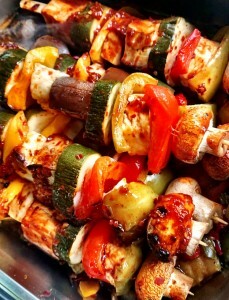 Grant’s vegetarian and vegan guests could all enjoy grilled veggie skewers and the gluten-free guest could enjoy our pigs in buns like most of the other guests, just with special bread rolls that we can supply, as all the other ingredients are suitable. On the day of Grant’s event, Hog Roast Wantage arrived at the venue several hours before we would be serving the food. We prepared the pig on-site by scoring it, covering it in water and then smothering in salt, and then set the temperature low on the hog roast machine and it was soon sizzling away. By midday, it was time to grill the skewered mushrooms, tomatoes, courgette, mixed peppers and red onion, slice the fresh bread rolls, get the lovely sauces ready and then serve the hungry guests.